All the latest releases, news and offers from the team at Ernie Els Wines. 2018 was quick off the mark for Ernie Els Wines, as we welcomed a group of our American clientele to South Africa during the first week of January. The group was made up of representatives from our US agent, Terlato Wine International, distributor reps and trade clients. A week-long itinerary was put together with the assistance of our counterparts in the valley. The group enjoyed world class hospitality at Ernie Els Wines, Rust en Vrede Estate, Antonij Rupert, Nederburg and Durbanville Hills. Each property in turn took it on themselves to host the group for a day or part thereof. As such, they experienced almost the entire Cape Tourism offering, from Table Mountain, Robben Island, Cape Point, Stellenbosch, Paarl and Franschoek wine tours. To end off the trip they were treated to a day Safari at Aquila Game lodge near to Cape Town. February was yet another busy month as the Ernie Els Wines team, represented by our globetrotting Louw Strydom, travelled to Dubai. It has been some time since we visited the market and it was encouraging to see that our brand presence is growing despite the slight slowdown in general market activity. As a brand, Ernie Els Wines looks forward to growing in step with the city of Dubai as they make the final preparations for the Worlds Fair in 2020. 3. Proprietor’s Range Release 2015: The greatest SA vintage ever? Time can drag when you’re waiting for something exciting to happen. For golf fans looking forward to The Masters, days can feel like weeks. So just imagine how long three years has felt for us in anticipation of the launch of the 2015 vintage of our Proprietor’s range? Still, they say the best things come to those that wait, don’t they! The reason for all the excitement? It all began with quiet whispers among the industry: Is this the greatest SA vintage ever? Surely too early to tell, but judging by early indications, we can honestly say that we’ve never seen anything like this before. Ernie Els Wines Marketing Manager Andrew Harris explains: “Although the vintage will be remembered as one of the driest and earliest in years, with a somewhat smaller wine grape harvest, everything happened as close to perfectly as possible. Good reserves were accumulated post-harvest in April and May, after which leaf fall occurred at the right time. A cold, wet winter led to full dormancy of the vineyards, which contributed to even bud break. Mother Nature played her part in perfect harmony with our winemakers! The wines are available directly from the winery. If you’re interested, we recommend you act fast. Visit the website: www.ernieelswines.com or email us at info@ernieelswines.com. 101 Meade Street is a contemporary South African restaurant situated in George. They love seasonal, simple and social food, made from fresh local produce, so we were happy to bring along our wines at the restaurant’s famous Carnivore Club Dinner last month. Brothers and chefs, Jeremy and Ben, have worked in restaurants throughout Europe, but the call of home was always there. They chose George on the Garden Route because of its unspoiled natural beauty and its proximity to the bounty of the Klein Karoo. By growing and maintaining their relationships with local suppliers throughout the region, they brought only the highest quality ingredients to their Carnivore Club Dinner. The evening started with canapés on arrival. The dinner celebrated the local produce of our beautiful country, with four courses paired to perfection with wines from the Ernie Els Wines portfolio. Live music entertained the guests throughout. 5. The 8th Ernie Els Wines Harvest Classic: Bookings limited! The 8th annual Ernie Els Wines Harvest Classic promises to be another fantastic day out to enjoy golf, good wine, good food and great company. This year we will be hosted at beautiful Erinvale Golf Club on Wednesday 11 April, followed by lunch on the terrace at the Ernie Els Wines vineyard. An early morning tee-off is the tradition, so all players will enjoy a shot-gun start at 8am. Teams of two (Betterball Stableford format) will set out to try and get their hands on the impressive floating trophy, the large format bottle of Ernie Els Signature. 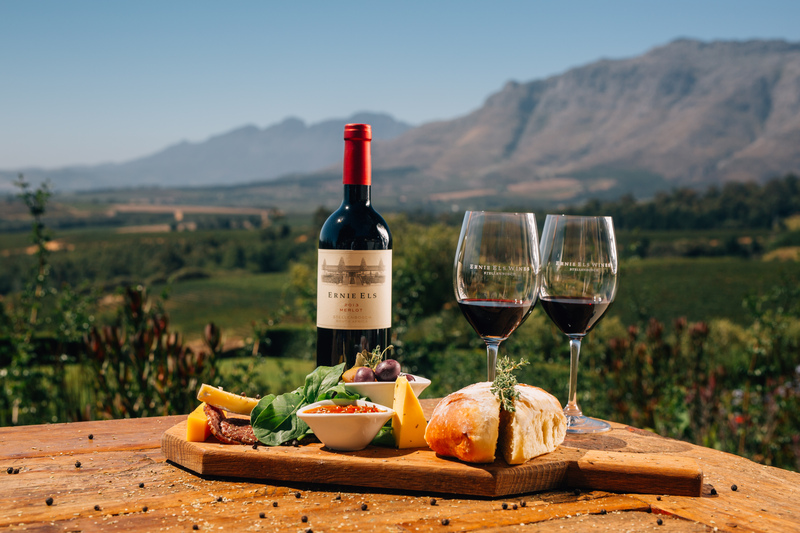 After the round, golfers will head up to Ernie Els Wines and will be welcomed by a refreshing, crisp Sauvignon Blanc which will kick-off a wonderful afternoon on the terrace overlooking the vineyards. A food & wine pairing lunch hosted by winemaker Louis Strydom will certainly be a highlight. Players will also be able to participate in the customary chipping competition off the tee-box in front of the wine cellar. The cost is R1600 per player and includes your green fees, golf cart, halfway house refreshment, a bottle of Ernie Els wine, an Ernie Els Wines golf shirt and cap, prize giving and lunch at the Ernie Els Winery.